Clean trans-fluid lubricates moving parts, dissipates heat and helps prevent wear and breakdown. 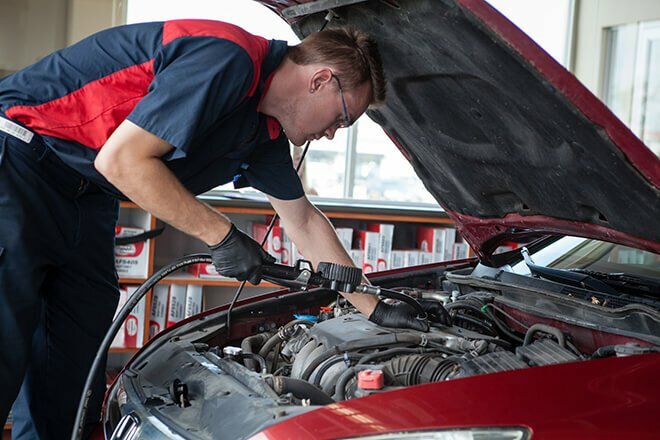 The Pro Oil Change in Kanata can complete a transmission service during your next visit. The function of the transmission fluid is to lubricate moving parts and to dissipate heat. Transmissions build contaminants due to friction and head and most of these contaminants are collected by the transmission filter. However, as the transmission ages, more contaminants build up to the point that the transmission filter is no longer effective. Generally, transmission fluid services are based on the manufacturer's recommendations which is based on time, mileage and driving conditions. Most manufacturers recommend every 2 years or 48,000 Kms. Your technician at your local Pro Oil Change can let you know about your specific manufacturer recommendations. All fluids exchanges, including transmission fluid services are based on the manufacturer's recommendations which is based on time, mileage and driving conditions. Typically, manufacturers recommend about every 2 years or 48,000 Kms. We use our state of the art system to inform you of your specific manufacturer recommendations.